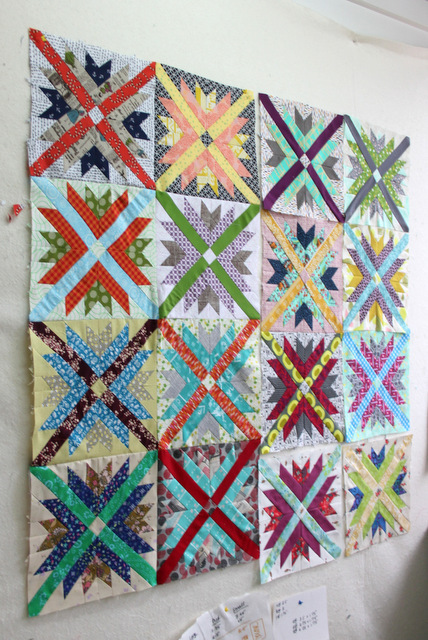 Winner of the Quilt Blocks Shop Challenge! 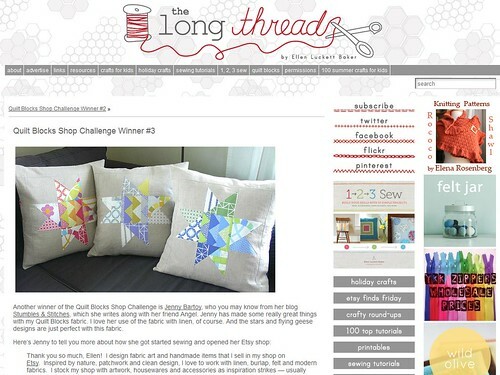 I am so excited to be one of the winners of the Quilt Blocks Shop Challenge on The Long Thread!!!!! 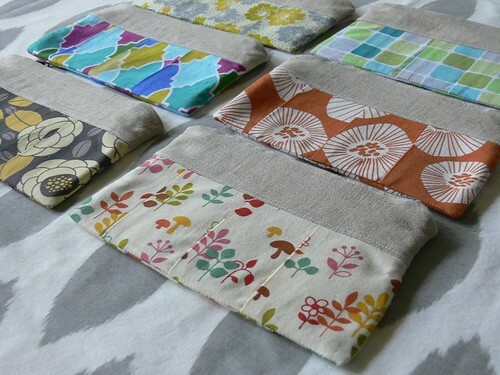 Ellen just featured me and my projects in a post on her blog. It was such fun to create projects for this challenge. 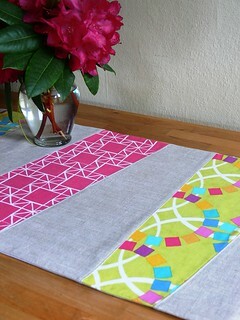 Her Quilt Blocks fabric line for Moda was wonderful to work with: a good mix of simple and intricate designs, modern and clean-lined with bright bold colors. Go check out The Long Thread to see my little feature as well as the lovely projects made by the other two winners! Huge thanks to Ellen for organizing this challenge and selecting me as a winner. 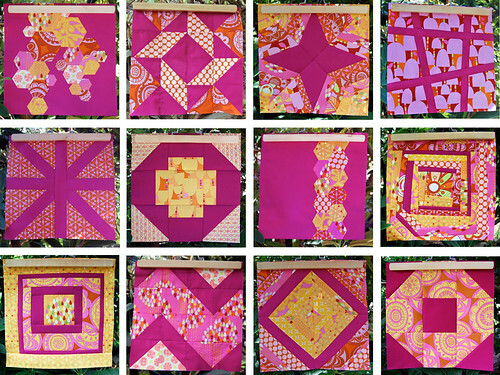 You can see more of the projects I made for the Quilt Blocks Shop Challenge here. 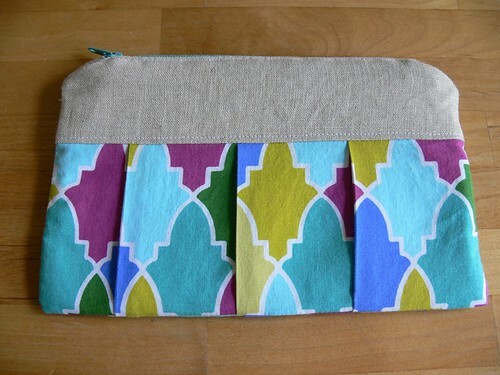 Have you made anything with this fabric line? I'd love to see! How's your Monday going? We're getting ready for a camping trip pretty soon so I took the kids to Target this morning to stock up on a few things. Ugh... I tried to be strategic about it: got them a snack AND a juice box (woohoo!) as we arrived, sat them in the humongous and impossible-to-maneuver kid cart that they love, and tried to follow my list as efficiently as possible. But it still took us an hour and a half to get out of there, by which point the kids were having a screaming and hitting match. Fun stuff. 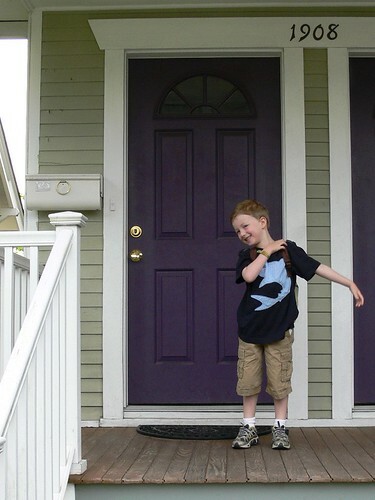 Last Thursday was Ben's last day of preschool. He loved his pre-K program so much, made some great friends and had a lovely teacher. She, along with several assistants and other teachers, took great care of him over the last year and a half. Before we left for the summer and Kindergarten, I wanted to show some appreciation with a little gift. My big boy getting ready for his last day! I've done gift cards in the past but opted for something a bit more personal and handmade this time. 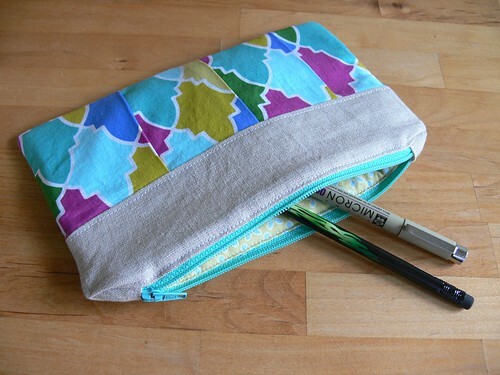 I decided that everyone can use a nice zipper pouch -- to store jewelry, make-up, pens, papers, money... 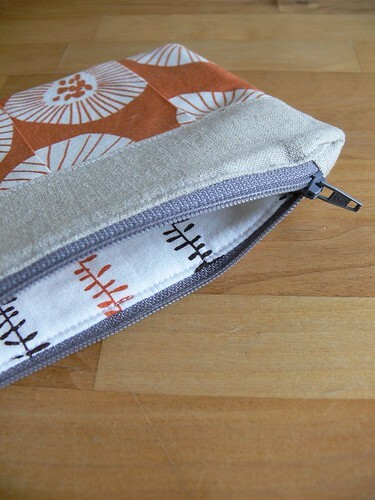 I had had an idea for a simple pleated pouch for a while, and went for it. I think they turned out pretty well! What do you think? 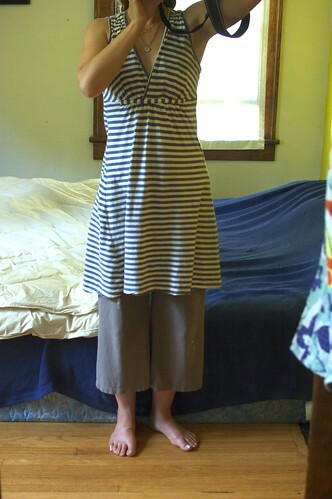 I used natural linen for the top and for the zipper ends. 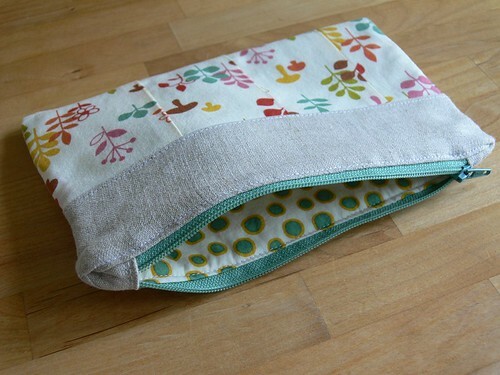 Flossie Teacakes does a great job explaining zipper ends in this pouch tutorial. I should have read this carefully when it came time to do mine. I must have sewn my zipper ends the wrong way somehow since they're all puckered in the corners. Oh well, they still look pretty cute! 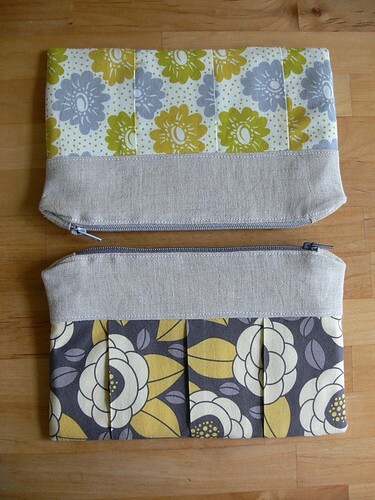 And I do love having finished and top-stitched zippers on a pouch. 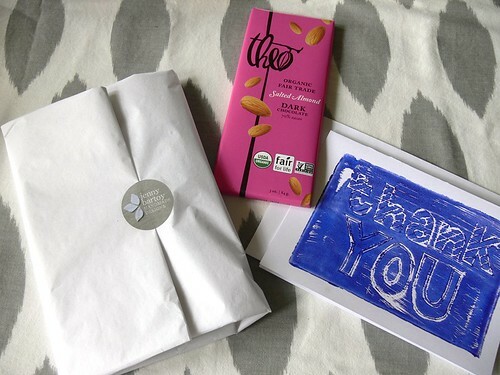 We used hand stamped thank you cards we had made after Christmas (we forgot to send most of them, ahem). 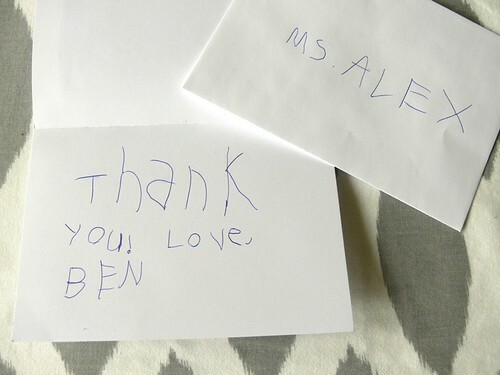 Ben wrote "Thank you! Love, Ben" in each and I added a little note of gratitude. It was very bittersweet! I also added a bar of local chocolate to each gift. I hope the lovely preschool ladies felt appreciated, we sure will miss them!! What did you do for teacher appreciation this year? Did you go the gift-card, store-bought or handmade route? Happy weekend! Where has the week gone?! 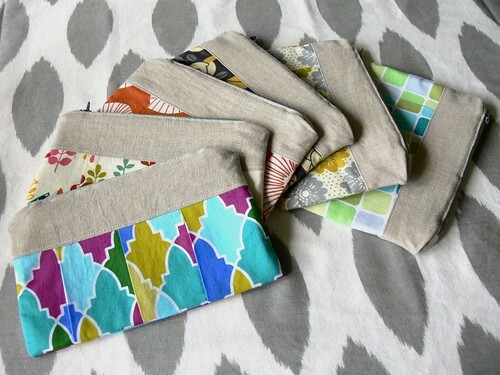 - I posted about the Short On The Line sew-along this morning. Check it out and sign up if you haven't yet! I am excited to make some shorts for my little dudes. 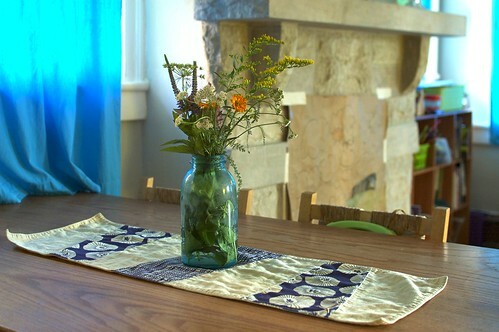 - We just welcomed a new sponsor: Sew Well Maide. We'll do a proper introduction very soon. In the meantime, please check out Karen's shop on Etsy, full of original quilt patterns and handmade items. You can like her on Facebook too! - I found Sarah and her blog Becoming Gezellig when she left a comment on one of my posts! 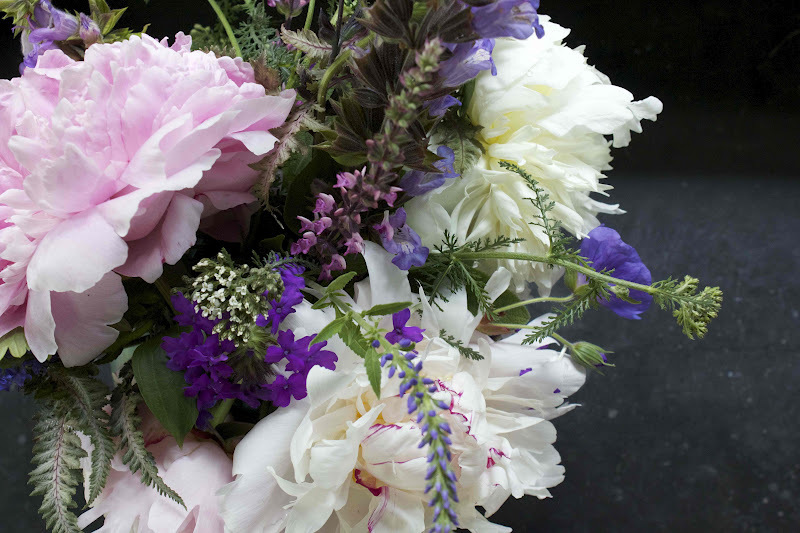 She is an excellent writer who shares recipes, flower photos, crafty shenanigans and more. 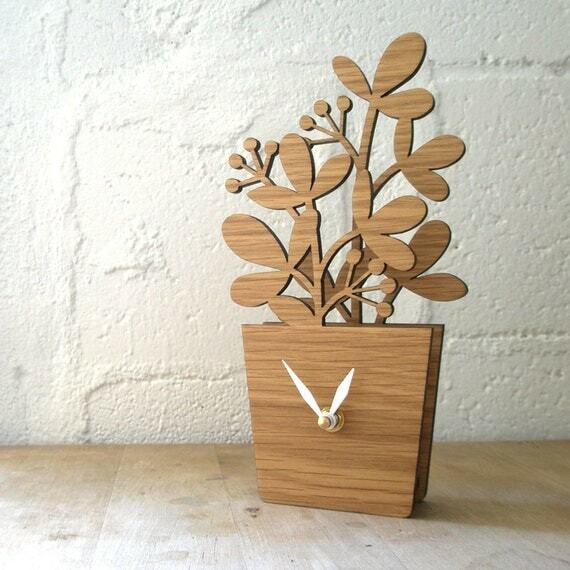 - I discovered Elegantitus via Keli at Drygoods Design Online. 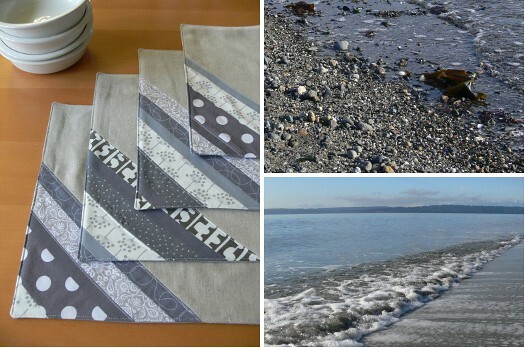 Elegantitus is the sewing blog of Cassie, a super talented, hilarious, tattooed, swearing, quilting Seattleite. She seems to be taking a bit of a bloggy break right now, but put her on your reader for later! - The Fox In The Attic: handmade and embroidered soft toys and pincushions! - Foxtail Creek Studio: unbearably cute felted scenes! Have a great one! If you have some favorite blogs and shops, please share in the comments! 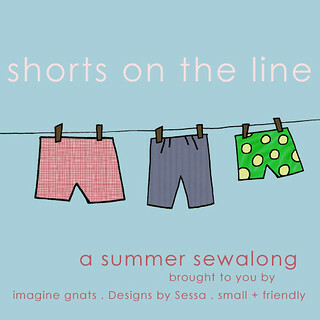 This July, our friend Rachael at Imagine Gnats, along with the bloggers behind Designs by Sessa and small + friendly, will be hosting Shorts On The Line, a summer sew-along. For the first 3 weeks in July, these lovely ladies will be sharing guest posts with shorts inspiration, tutorials, and pattern reviews. 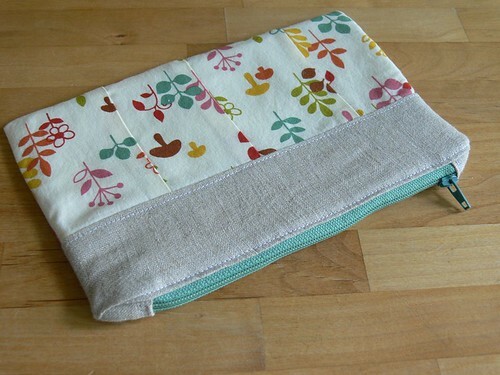 Those sewing along at home will have a chance to be featured in sew-along round-up posts the last week of July and might win some nifty stuff!! The judge panel is pretty impressive and there will be some awesome prizes, including fabric, patterns, and gift certificates. I am excited to be participating in Shorts On The Line with a project or two!! I had been wanting to make shorts for the boys and myself (well, more like short pants for me...), so this was perfect timing! My guest post is scheduled for July 20, so stay tuned. This should be great fun. You can see the rest of the line-up and all the details here! Go sign up and make some shorts! Hello and happy Summer Solstice!! Do you have any fun, seasonal plans today? We are so happy to be enjoying the first sunny and decently warm day in weeks (73F expected this afternoon), so we'll be headed outside as soon as I hit "Publish" on this post. We've had so much going on this June that I haven't had a chance to be very thoughtful about a Solstice celebration. But, I guess being outdoors to enjoy Mother Nature is its own celebration! June is apparently "gift-making month", who knew?! 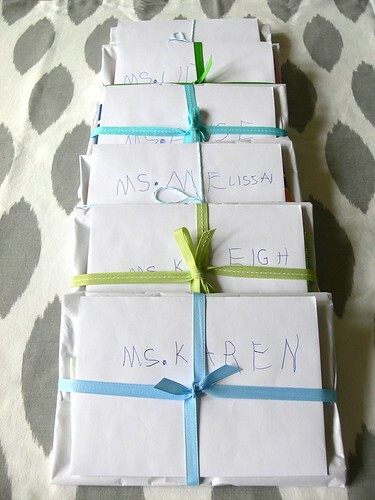 Between teacher appreciation, weddings and new babies, I have been cranking out gifts like a one-person factory lately! 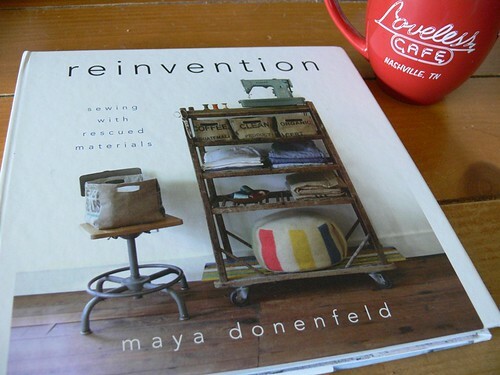 I just received Maya's book in the mail yesterday, courtesy of Wiley Crafts. We'll be reviewing Reinvention as part of our Inspired by Nature series. And WOW. It is beautiful and so inspiring. What do you think, Angel? Meanwhile the kids are keeping me busy as ever. Ben doesn't nap in the afternoon anymore. On a good day, he sits next to me at the dining room table and we both work on our own projects while we chit chat. Henry is a different story. He no longer naps in the morning which has shifted my productivity schedule (I used to work while he slept and Ben was at preschool). Now our mornings are spent playing, running errands or hanging out at the park. If I'm lucky he naps for a good stretch in the afternoon. When that doesn't happen, he "helps" me with whatever I've got going on like, oh say, basting a quilt? So that's about it! As you can see, I've been a busy bee. I'm so excited that summer is beginning! We are staying put for most of the summer but we have so many fun plans -- our first camping trip! my little brother visiting! soccer camp! What are you working on these days? What are you doing to celebrate the arrival of Summer? I'd love to hear from you in the comments. Your beautiful backyard post inspired me to stash the camera in my big mama purse on the way to preschool pick-up this week. I had been obsessing over a patch of wildflowers at a particular neighborhood intersection through which we walk nearly daily, and finally captured it! I wasn't kidding when I mentioned that wildflowers adorn the roundabouts in my neighborhood. Most of the houses have been here for well over a century and, come Spring, there are flowers everywhere! Many yards are carefully manicured, but a good portion also feature gardens (and chickens!) 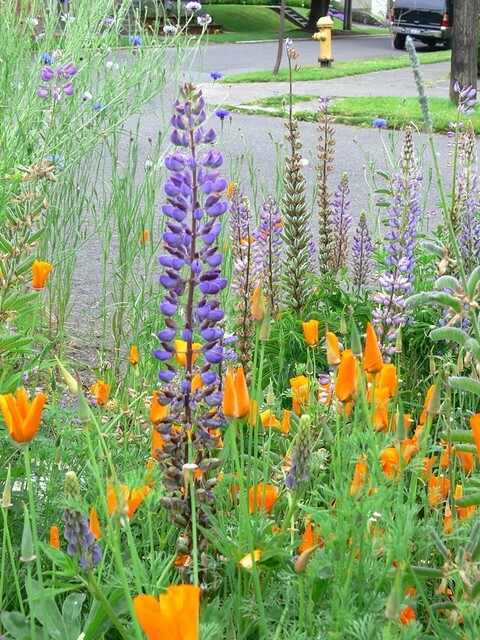 or wonderful assortments of wildflowers that have probably come and gone for years and happily spread out onto the sidewalk grass patches -- and the roundabouts! I love being bombarded by color when we walk through the neighborhood. 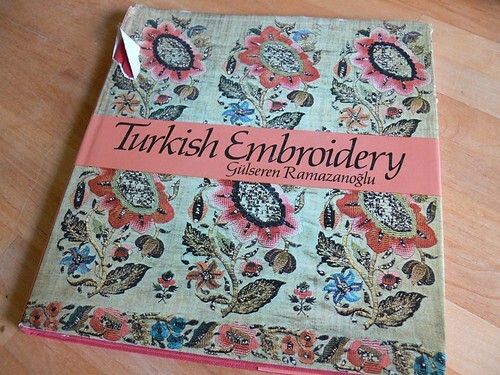 Today I wanted to show you the book I scored at the thrift store a couple of weeks ago: Turkish Embroidery by Gulseren Ramazanoglu. 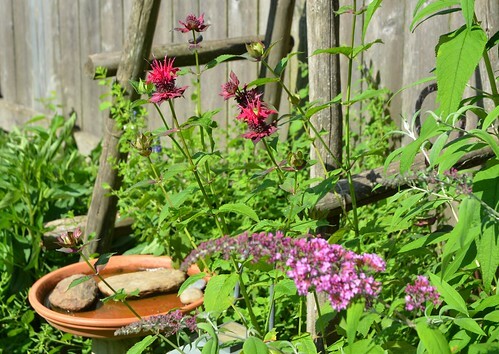 Here's some inspiration from my garden, in the area that's planted with lots of flowers beneficial insects like. I'm hoping to do something with these images, soon! 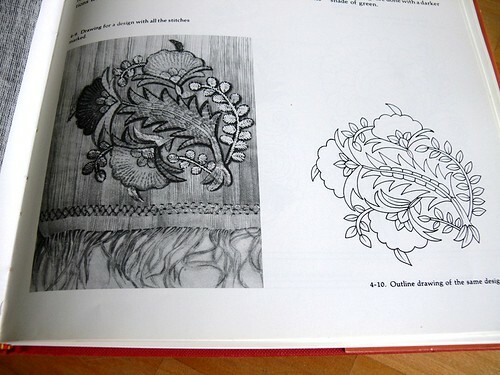 Maybe some embroidery. 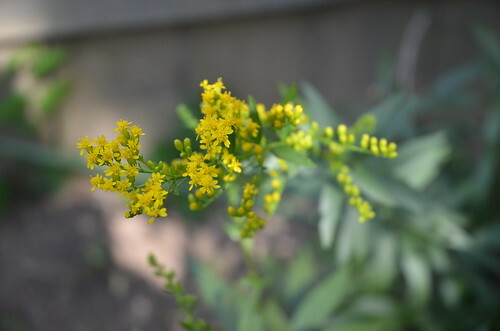 And that goldenrod up there is destined for some dyeing, once it gets a bit bigger. Please welcome back our wonderful sponsors for June. We love supporting their shops and hope you will too. 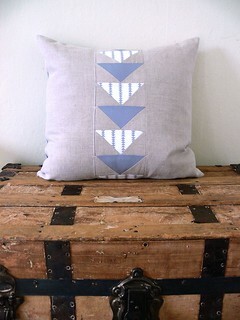 Drygoods Design Online is welcoming new fabrics every week lately. Check out the New Arrivals section for updates. Some of my favorites include Happy Drawing and Quilt Blocks. I also see some adorable Kokka prints (love those navy cars!). And get ready: new Quilt Market releases start to come in at the end of the month, along with new markdowns. Can't wait to see what Keli picked out! Keli is very excited about the Figgy's Patterns trunk show at her brick-and-mortar Seattle store on the evening of June 23rd -- I'm hoping to go! The new shop is open to the public on Saturday (10:30 to 5:30) and Sunday (10:00 to 3:30), and other days by appointment. If you're local, go check it out, you will not be disappointed! 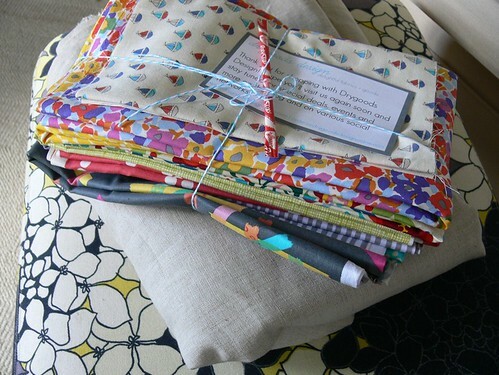 As always, Fat Quarter Shop is stocked with delicious fabrics, bundles and patterns. Browsing their "What's New" section, I found the lovely Serenade collection by Kate Spain, lots of Christmas fabrics (just in time for Christmas in July!!) 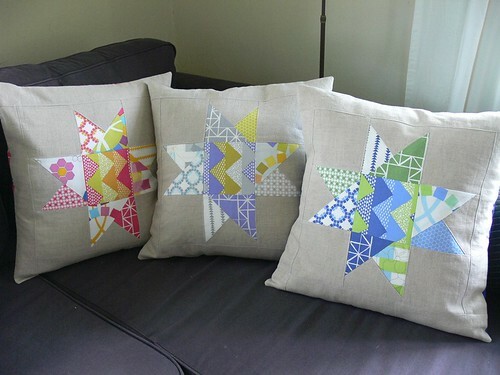 and some great modern quilt patterns by Zen Chic Quilt Patterns and Prairie Grass Patterns. Fat Quarter Shop has some super fun Block of the Month programs, including the Designer Mystery BOM. 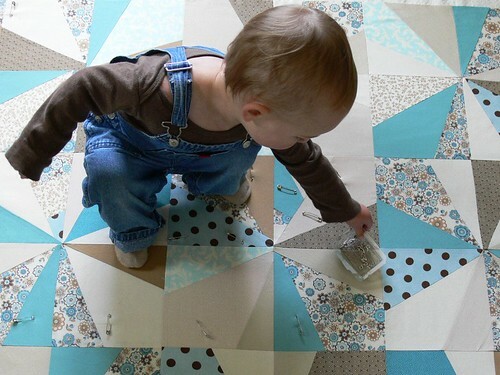 Check it out and sign up to receive monthly quilty goodness in your mailbox! Thank you to these wonderful businesses for sponsoring Stumbles & Stitches and allowing us to keep on blogging! We are currently booking 3rd quarter ads for our sidebar. 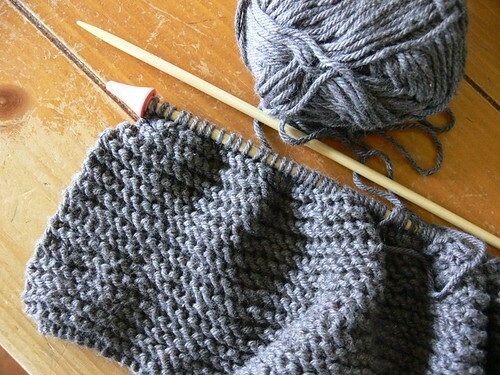 If you'd like to advertise on Stumbles & Stitches during the months of July, August and/or September, reserve a spot by contacting us at stumblesstitches [at] ymail [dot] com. You can find out all the details on our Advertise page. We've got a LOT of fun stuff planned for the coming months, including the new Inspired by Nature series and our second annual Christmas in July fun fest. It's a great time to advertise! Thank you so much for your consideration. Kathreen asked us to participate in her guest series on creativity and we wrote about how Nature influences our creative process. It was such an interesting exercise to analyze and describe how the natural world weaves itself into our projects. We also loved discovering more about each other's creative process -- we both learned something about the other! I hadn't grasped how important the animal world was to Angel and how meaningful sketching is for her; she liked understanding the inspiration behind my fabric and texture choices. We hope you enjoy reading the post! 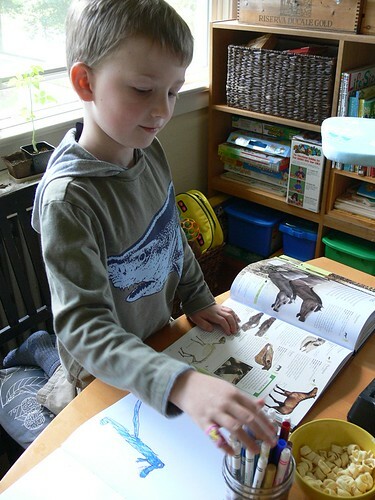 This post about Nature and the creative process officially launches our Inspired by Nature series. You can read more about it here. We look forward to sharing more nature-inspired projects with you all very soon! Thank you so much to Kathreen and Whip Up for featuring us today! 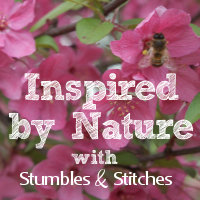 Today we'd like to introduce a new series that will be ongoing on Stumbles & Stitches: Inspired by Nature! This new series will be off to an exciting start with a guest post on Whip Up tomorrow! Please check in. We can't wait to hear what you think! Nature is ever present in our lives and environment. Angel and I find ourselves drawn to it for inspiration in our projects, both consciously and unconsciously, and want to share more of this process with each other. In our home lives and the way we raise our families, we strive to be respectful of the Earth, conscious of the natural world, and mindful of the Seasons. In our creative endeavors, through our choice of materials and subject matter, we find ourselves connected to and Inspired by Nature. In this series, we will share projects with each other (and with you!) that are representative of this push to connect further with Nature in our creative process. We hope to inspire you as well, to connect with your natural environment and let it guide your creative life and projects. The Inspired by Nature series will be ongoing, which means you can expect regular posts through the next weeks and months focused on this theme. There will be posts and projects by us of course, but also guest posts, interviews, tutorials and more. We plan on sketching and drawing more too, so get out your sketchbook and join us! We've created a button for this series. Feel free to grab and share it! Please share your own projects that are inspired by Nature on your blog and link back! We hope you'll also post photos in our Inspired by Nature Flickr pool. Finally, if you have a project or guest post to contribute to this series, we'd love to know. Please submit it at stumblesstitches [at] ymail [dot] com. We're so excited to get this rolling, and can't wait to hear what you all think! I hope you're having a good week so far. I miss you! It's hard to believe that less than a week ago, we all spent such an awesome day together. I'm now back to the routine in Seattle, with preschool, laundry, appointments, etc. It's been so busy and the weather has been disgusting. The HEAT came on 2 mornings this week! I kid you not. Brrrrrrrrrr. The day we visited you last week was the deadline for the Quilt Blocks Shop Challenge organized by Ellen Luckett Baker of The Long Thread. 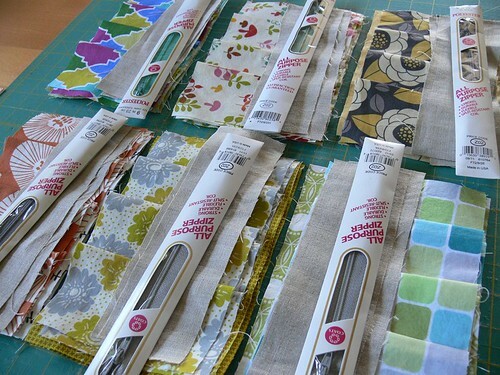 In a nutshell: make things for your shop with Ellen's Quilt Blocks fabric collection, she will pick 3 favorite contestants, feature them on her blog and host their ad in her sidebar for 3 months. Pretty cool! Since I was planning on making things with her collection anyway, I got to work! 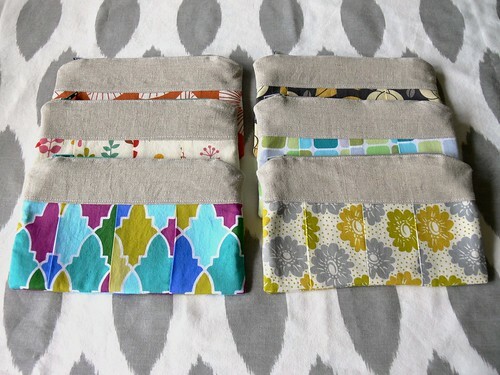 You know me, I can't ever do things half-way, so I put together a collection of SIX "quilt block" pillows using the Quilt Blocks fabric, as well as one table runner. 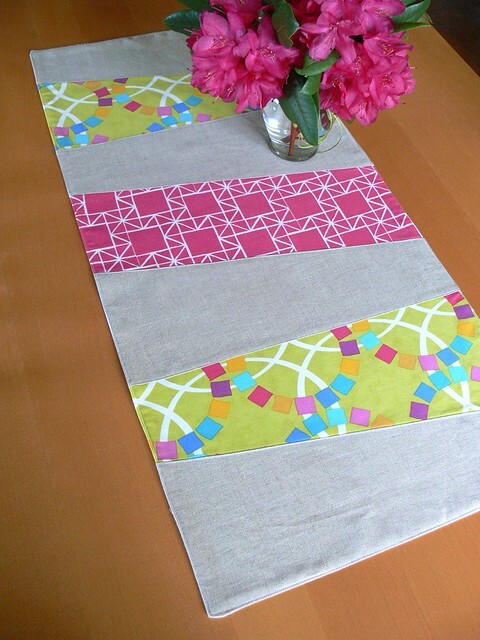 I juxtaposed Ellen's modern fabrics with natural linen (I guess that's my "signature" combo by now). Here are photos of the projects I made and entered in the challenge. You can see more picson Flickr, and I'm starting to list them in my shop. What do you think?? Jenny, are you recovering from your travels? I saw the photo of Ben on FB, passed out in the middle of the day from jetlag. Poor thing! Is Henry still teething? 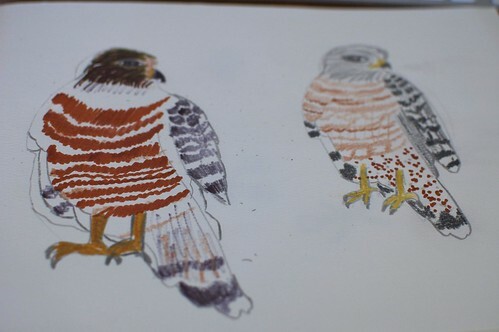 I had a few hours of time to myself yesterday afternoon, and sat down to sketch a Red Shouldered Hawk. There is a nest of them close by, I hear them at least once a day, sometimes more! Lee thought it was a different type of hawk, so I did some research online and in our nature guides to be sure, matching the call was the easiest way to go. There is something so comforting about knowing more about my natural surroundings and animal neighbors, with the (over)abundance of information available online now it's nice to just settle down and take a look around in your own backyard. I scored at the thrift store this weekend, this super cute Gap dress was one of the things I found. The pants are Patagonia, they have bleach stains and paint on them but they are still comfortable and cute. I just have to wear stuff that can get ruined when I am in "radical homemaker" mode, and that is about 75% of the time, but I don't want to look unpresentable (by my standards) if someone stops by (which I'd like to encourage especially this summer). I've separated my clothes into "working at home" clothes and "in public" clothes so that I don't ruin the nicer clothes I have, since I will walk right out into the garden in a pair of wedge heels and a skirt and get filthy almost instantaneously. Would a dress like this be hard to make? I'll take closer up photos if you think it would help decipher. The way the skirt is cut is interesting, the drape is nice! What are you up to this week? Hope you are hanging in there, talk to you soon! 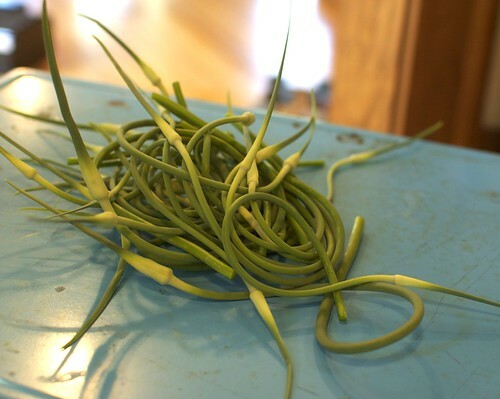 Readers do you have any favorite garlic scape recipes? What unidentified (but frequently seen) wildlife do you have in YOUR backyard? Jenny! Your plane is about to take off, I hope you are somewhat sane when you sit down to read this later today. Your visit went by so fast, it hardly seems real! I don't know how we crammed so much into that 12 hours, thank goodness all our time together over the years (five!) has made it possible to shift into hang out mode the minute we're all reunited. Like I mentioned before, it doesn't seem right somehow that we live so many miles apart. To say that the visits with your family left ours better off doesn't begin to describe it (and that's not just because you brought presents). You know how stressful things have been for us the last six months, and spending time with people we love (that love us, just as we are), sharing our neighborhood and home and watching the kids play? It was just the touchstone I needed to refocus after many months of walking around in a fog brought on by myriad factors. I think it's official: we've moved from "friend" status to "family". I say that it seems like your visit was hardly real, yet I can look around my house this morning and see signs of my newly found focus (and motivation). Our face to face time was just what I needed to give me that push towards simplifying things, because I thought "I can't wait to show Jenny!" I cleaned up the area that stores all the child appropriate craft supplies (meaning what I'm comfortable with them using without adult supervision. There's not much that's off limits with an adult helping, but some stuff gets stored out of reach for safety reasons). There was a tall bookcase there before, and I was constantly worried it would fall over. Every cubby will have a piece of gaffer's tape on the side saying what goes where, so the kids (and adults!) can remember what goes where. 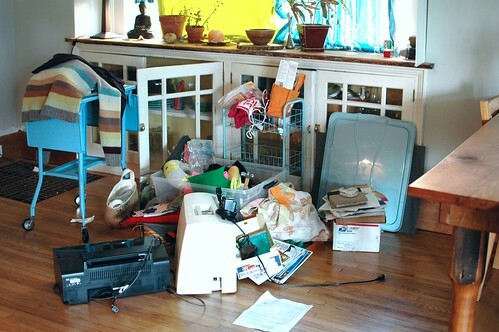 I'm really going to focus on putting one thing away before something else comes out this summer, with such an open floor plan we all have to be considerate of each other when it comes to our personal projects and clutter. 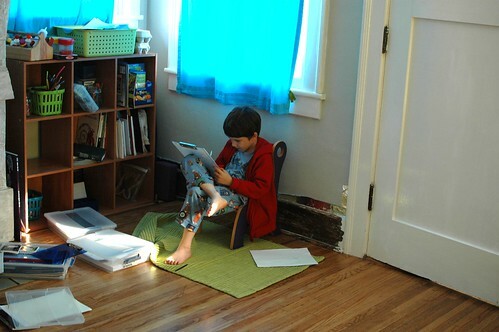 Plan: to make some floor cushions for the kids to sit on. Any idea how to keep the polyfill from bunching? Ian is drawing wizards up there, the show he put on with Ben and Silas on Thursday has really inspired him. I can't bear to take down the backdrop Ben and Ian drew together, and just in case your husband thinks he didn't inspire me, please show him that I've brought the copper apple butter kettle inside with plans to clean it soon! I also decluttered (i.e. 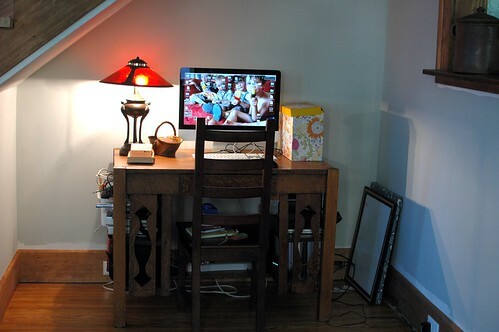 de-Angeled) the desk area under the stairs. I don't know if you are too polite to remember the disaster area this was while you were here, I was trying to use it as a place to store my craft supplies (a small portion of them) and it was just not working. This desk is what we use for the desktop computer, bill paying, etc. and all the members of the family use it at least once or twice a day for something. It's also close to an outlet, so we end up charging our phones here, and it's close to the kitchen counter so the wallets, keys and other stuff end up here too. So turning it into a family desk instead of a place for me to deposit all my buttons, gardening books, magazines made more sense because I was constantly battling the two and it was a MESS. We'll install shelves above the computer once we decide on how we want them to look. That means I have this mess to clean up and organize, along with the five or TEN bins of craft related stuff I have upstairs in the attic. It's no wonder I haven't been making things, I can't find anything! I can't wait to see you guys again, even if it is probably going to be next year. Let's start planning, soon! I'm looking forward to all the things we have to share with each other this Summer.